I first became interested in amphibians as a small child and used to spend my spring and summers up to my knees in mud and ponds chasing after frogs, toads and newts. By the age of nine my bedroom was crammed full of an assortment of reptiles and amphibians and I spent all my free time reading about them. I was an avid reader of Gerald Durrell’s books and his call to action woke something inside me and I decided to pursue a career in conservation. I studied Conservation Biology at the University of Surrey Roehampton and then worked towards my MSc at the Durrell Institute for Conservation and Ecology at the University of Kent. 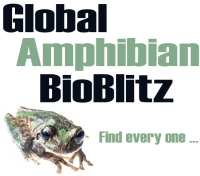 This was an extremely formative time for me, global amphibian declines were making headlines and the Global Amphibian Assessment had just been published. As well as working at ZSL London Zoo in the UK, Ben Tapley has also worked at Durrell Wildlife Conservation Trust in Jersey, and has done amphibian field work in Dominica, India and China. After completing my MSc I secured a job as an amphibian and reptile keeper at Durrell Wildlife Conservation Trust in Jersey. Here I came face to face with some of the threatened amphibians I had read so much about – Mountain Chickens and Mallorcan Midwife Toads. I had great support from Gerardo Garcia, Matt Goetz and Kay Bradfield and refined my amphibian husbandry skills and was actively involved in conservation breeding programs for non-native species such as the Mountain Chicken as well as work head-starting a native species, Agile Frogs. Whilst at Durrell I got my first taste of developing amphibian conservation and husbandry capacity helping to deliver various courses for both the European zoo community and courses aimed at building capacity in the regions that support the most diverse amphibian assemblages. It was also at Durrell where I had my first experiences working in the field with amphibians and spent many cold nights capturing, marking and radio-tracking toads, and later on, aquatic caecilians in Colombia, where I was keen to implement environmental data collected from the field into the management of specimens back at Durrell. The field work bug had really bitten me and I left Durrell to gain more field experience and headed to India and developed an amphibian population dynamics study at the Agumbe Rainforest Research Station with the Gerry Martin Project in one of the wettest places on the planet. I firmly believe that ex situ management has a pivotal role to play in the conservation of many threatened amphibian species. In 2011 I began my association with the Zoological Society of London (ZSL) and headed out to volunteer on the Mountain Chicken frog program in Dominica. Here I worked with local partners and helped oversee the captive husbandry of frogs maintained in a dedicated breeding facility and even managed to find several Mountain Chickens during field surveys. This was a fantastic opportunity, and it was great to be involved in both the ex situ and in situ components of this fantastic project. 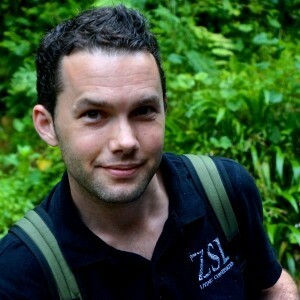 I returned to the UK in 2012 and secured the position of Team Leader for the herpetology section at ZSL London Zoo. In 2012 we managed to breed the Mountain Chickens at ZSL for the first time and these were subsequently reared and released on Montserrat. It was at ZSL that I first became involved in Chinese Giant Salamander conservation and I am currently working as part of a team to develop the evidence-base and capacity to underpin, promote and conduct a strategic conservation plan for the species within its native range in China. This involved developing standardized survey techniques and training partners in field surveys which are currently being rolled out across much of the former distributional range of the species. I also work very closely with the EDGE of Existence program which highlights and conserves one-of-a-kind species that are on the verge of extinction. I have been fortunate enough to work with many of the amphibian EDGE Fellows on projects with Chinese Giant Salamanders, Indian Toad-skinned Frogs and the Lake Lerma Salamander. At ZSL London Zoo we have a large collection of amphibians, and we are currently focusing on caecilians. In partnership with the Natural History Museum we are developing evidence- based husbandry protocols and have gained new insights on the impact that chytridiomycosis may have on caecilians. We are also developing husbandry and breeding protocols for the Critically Endangered Lake Oku Frog and various species of midwife toads. The collection at ZSL is constantly evolving and we are always developing new research programs and most importantly disseminating the information through peer review publications. I also chair the British and Irish Association of Zoos and Aquariums (BIAZA) reptile and amphibian working group and co-chair the Amphibian Specialist Group, Captive Breeding Working Group. 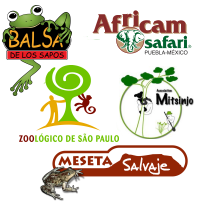 In these groups I work with other members to promote best practice in terms of ex situ management of amphibians. I firmly believe that ex situ management has a pivotal role to play in the conservation of many threatened amphibian species and I hope to continue to work with partners to develop and build conservation husbandry capacity.